Regardless of how diligent a person is with the brush and floss, dental disease is still a threat. And if and when it does arise, we have the necessary modern equipment and treatment options of both the “tried and true” and “latest and greatest” variety. We’ll harness the power of modern dentistry to minimize the damage and restore your teeth’s function and appearance — in many cases to better than normal. As general dentists, most of the work we do falls into the category of restorative dentistry. Composite resin is a tooth-colored filling material that can be used to restore small- to medium-sized cavities or chipped areas on both front and back teeth. 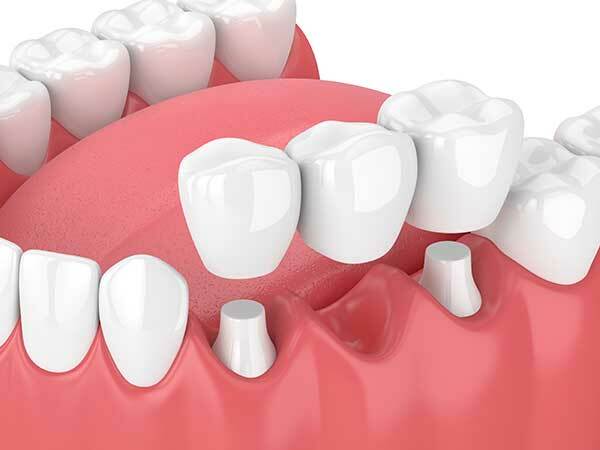 After the tooth surface is prepared, a powerful bonding agent is applied to ensure that there is a structural and antimicrobial seal along the filling’s edge. Lastly, the photo-sensitive composite is placed, light-cured and then polished until smooth and comfortable. 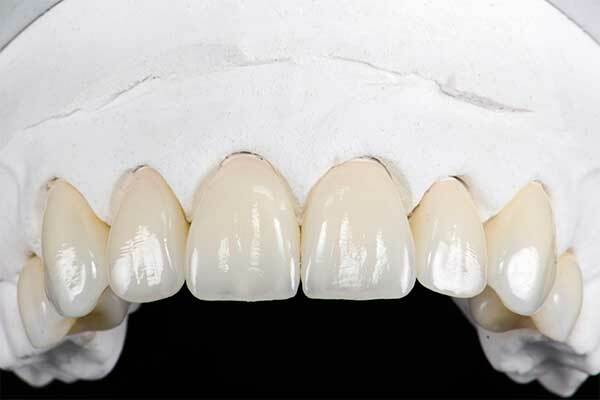 Advancements in composite materials continue to make possible composite fillings that are even stronger, more durable and aesthetically pleasing — the filling material of choice for modern dentistry. A dental crown or “cap” is used to cover the remaining tooth structure in order to restore its original size, shape and function when a cavity, chip or crack has compromised more than 50 percent of a tooth’s chewing surface. 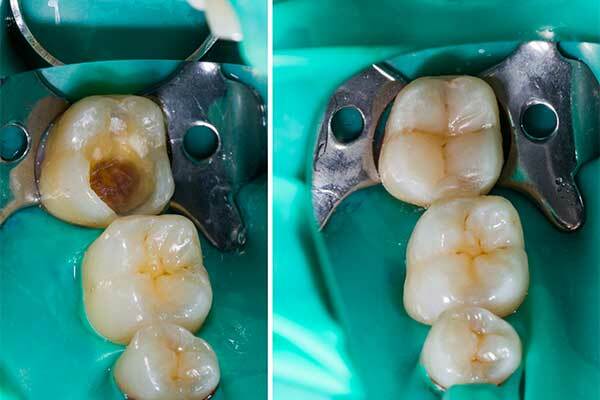 A crown may also be indicated for any tooth that has undergone root canal therapy — a procedure that can make the tooth more prone to fracturing. Crowns can also be placed on implants to replace missing teeth. A bridge is a fixed (nonremovable) restoration that can be used to replace one or more missing teeth. Healthy teeth or implants adjacent to the empty space are used to anchor and support the bridge. The replacement teeth, or pontics, “bridge” the toothless space to restore function and aesthetics. 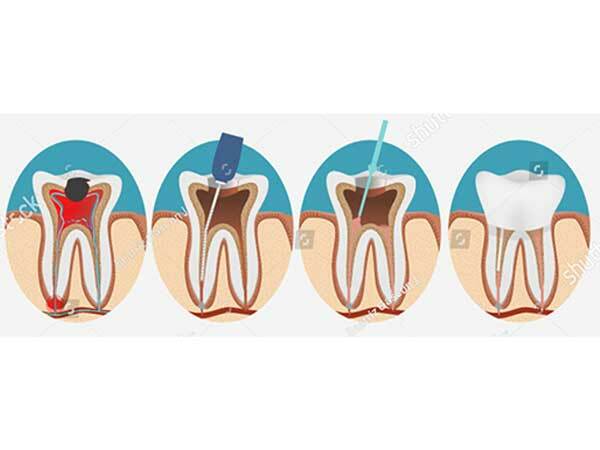 Endodontic treatment (root canal therapy) is necessary when the pulp, the soft tissue inside the root canal within the tooth, becomes inflamed or infected. The inflammation or infection can have a variety of causes: deep decay, repeated dental procedures on the tooth, or a crack or chip in the tooth. In addition, an injury to a tooth may cause pulp damage even if the tooth has no visible chips or cracks. If pulp inflammation or infection is left untreated, it can cause significant pain or lead to an abscess. We use the most modern pain management techniques to make the procedure as comfortable and stress-free as it can be for our patients. Strategic placement of titanium artificial roots can be used as a foundation to replace missing teeth, improve cosmetics and stabilize loose dentures. Despite all the advancements in modern dentistry, there are situations when a tooth cannot be saved. 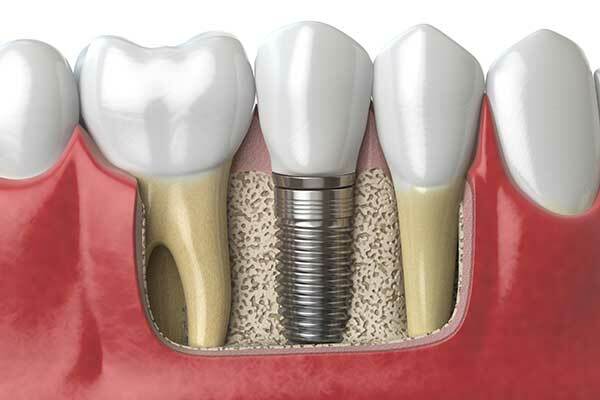 In these instances, a dental implant can be used to replace the root of a missing tooth. The implant can then be used to support individual crowns, bridges or dentures. 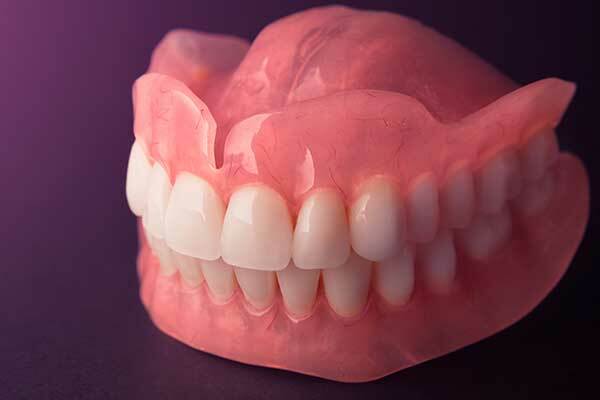 A denture is a removable replacement for missing teeth and surrounding gum tissues. Two types of dentures are available: complete and partial dentures. Complete dentures are used when all the teeth are missing, while partial dentures are used when some natural teeth remain. 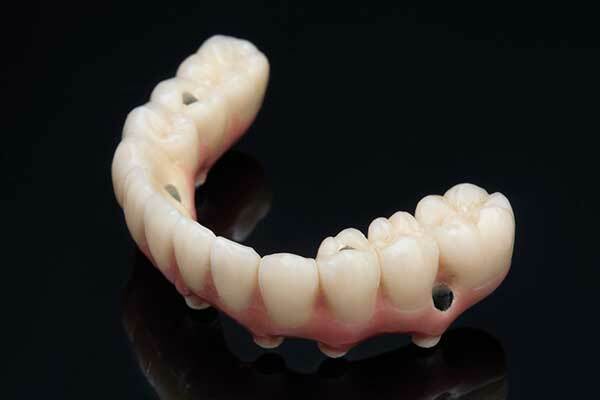 A hybrid denture, like a complete denture, is used when all the remaining teeth on one arch are missing. Unlike a complete denture, the hybrid is attached to at least four dental implants for increased stability and retention. Some hybrids are fixed in place and not removable. Others, known as fixed-detachable hybrids, have specialized connections that allow the denture to be removed for cleaning.